This is a 4 pc kitof new replacement dash vent knobs black & ferrules in CLEAR for use on 1968 Camaro and Firebird models. 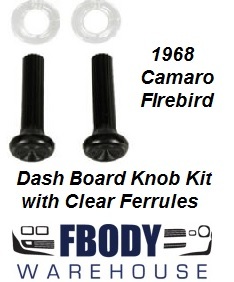 This is a pair of new replacement dash vent knob & ferrules kit for use on 1968 Camaro and Firebird models. Accurate reproductions of unique parts. Ferrules in clear acrylic. Pull knobs in black with correct thin shaft and fluting. Four piece set. Use the drop down menu below to select ship to locations.